Charles “Charlie” August Daum passed away peacefully with his family by his side on February 11, 2019. He was born to Adam and Louise (Fischer) Daum on February 17, 1931. He graduated from FJ Reitz High School in 1949, Evansville College in 1953, and earned a Masters degree from Indiana University. He did additional graduate work at IU and Purdue University. He belonged to the Phi Zeta Fraternity and was a charter member of Lambda Chi Alpha Evansville chapter. Charlie married Mary E. Phillips in 1953. He and Mary celebrated 65 years of marriage in November 2018. He served in the U.S. Army and was stationed in Germany. Charlie and Mary lived with a German family during his time in the Army. In 1996, they were able to return to Germany and visit with the German family. Charlie played and enjoyed sports and was a high school basketball and football official for many years. He was a college basketball official for four years. He began his educational career as a teacher in Evansville at Baker Elementary School. After 13 years at Baker, he then became the principal at Newburgh Elementary School in Warrick County. He retired from the Warrick County School Corporation after 38 years in education as Director of Business Services in 1991. After his retirement, Charlie spent many hours volunteering in the community and his church. 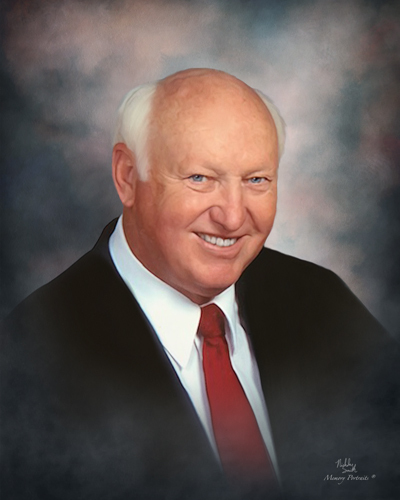 He held many offices at Zion Evangelical Church of Christ where he was a lifelong member. He was awarded Zion’s Heart of Gold award in 2001. He was a board member of the Good Samaritan Home in which he chaired the board for two years and was instrumental in the expansion of the Good Samaritan, especially the Alzheimer’s Unit and The Pavilion. Charlie received national recognition as a board member from the Council for Health and Human Service Ministries of the United Church of Christ. Charlie was a charter member of the Newburgh Civitan Club in which he served as a board member and president. His special interests included sports of all kinds, fishing, traveling, and gathering of family. He especially enjoyed the beaches of Sarasota, Florida. Surviving are his wife, Mary; daughters Laura Daum Conkright (David) of Owensboro, KY and Jennifer Daum Bode (Jerry) of Louisville, KY; son, Brian Daum (Michele) of Newburgh, IN; his sister Judy Thomas of Silsbee, TX; grandchildren, Christopher (Kelsea) and Lindsey Conkright; Joshua and Courtney (fiancé Ryan Kappler) Daum, and Alexis and Jonathan Bode, and many nieces and nephews. Funeral Services will be held at 11:00 a.m., Saturday, February 16, 2019 at Boone Funeral Home East Chapel – A Family Tradition Funeral Home, 5330 Washington Avenue with Rev. Dr. Robert Koch. Burial will be in Park Lawn Cemetery where American Legion Kapperman Post 44 will render military rites. Friends may visit from 3:00 p.m. until 7:00 p.m., Friday, February 15, 2019 and from 10:00 a.m. until service time, Saturday, February 16, 2019 at BOONE FUNERAL HOME EAST CHAPEL. Memorial contributions may be made to Zion Evangelical United Church of Christ, 415 NW 5th St, Evansville, IN 47708 or the Good Samaritan Home, 601 N Boeke Rd, Evansville, IN 47711.